In Striving in Common, Jennifer Jellison Holme and Kara S. Finnigan seek to build a bridge between two largely disparate, yet interconnected, conversations—those among education reformers on the one hand, and urban reformers on the other. 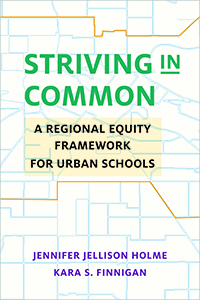 In this carefully considered volume, the authors show how the challenges faced by urban schools are linked to issues of regional equity and civic capacity. At a time of increasing concern over inequality in education and society, Striving in Common sets forth an ambitious agenda for rethinking the parameters of education policy and connecting education reform to broader efforts at urban reform.